Excerpted from "The Sino-American Comedy of Errors," Asia Times, November 10, 2014. The implosion of America's geopolitical position has placed risks and opportunities at China's doorstep, to Beijing's great surprise. A year ago, Chinese officials privately reassured visitors that their country would "follow the lead of the dominant superpower" in matters relating to Middle East security, including Iran's attempts to acquire nuclear weapons. For the past several decades, China has allowed the US to look out for the Persian Gulf while it increased its dependency on Persian Gulf oil. By 2020, China expects to import 70% of its oil, and most of that will come from the Gulf. The Chinese view has changed radically during the past few months, in part due to the collapse of the Syrian and Iraqi states and the rise of Islamic State. It is hard to find a Chinese specialist who still thinks that the US can stand surely for Persian Gulf security. Opinion is divided between those who think that America is merely incompetent and those who think that America deliberately wants to destabilize the Persian Gulf. Now that the US is approaching self-sufficiency in energy resources, some senior Chinese analysts believe it wants to push the region into chaos in order to hurt China. One prominent Chinese analyst pointed out that Islamic State is led by Sunni officers trained by the United States during the 2007-2008 "surge" as well as elements of Saddam Hussein's old army, and that this explains why IS has displayed such military and organizational competence. The complaint is justified, to be sure: General David Petraeus helped train the 100,000-strong "Sunni Awakening" to create a balance of power against the Shi'ite majority regime that the US helped bring to power in 2006. How, the Chinese ask, could the Bush administration and Petraeus have been so stupid? To persuade the Chinese that they were indeed that stupid is a daunting task. The decline of American influence in the region from which China obtains most of its oil is not a happy event for Beijing. China's attitude towards Washington has turned towards open contempt. Writing of the mid-term elections, the official daily newspaper Global Times intoned: "The lame-duck president will be further crippled ... he has done an insipid job, offering nearly nothing to his supporters. US society has grown tired of his banality." But the decline of American influence in the region from which China obtains most of its oil is not a happy event for Beijing. China did not anticipate the end of the free ride from the Americans, and it isn't sure what to do next. It has tried to maintain a balance among countries with whom it trades and who are hostile to each other. It has sold a great deal of conventional weapons to Iran, for example, and some older, less-sophisticated ballistic missiles. But China has sold Saudi Arabia its top-of-the-line intermediate range missiles, giving the Saudis a "formidable deterrent capability" against Iran and other prospective adversaries. China obtains more oil from Saudi Arabia than any other country, although its imports from Iraq and Oman are growing faster. Because the latter two countries are closer to Iran, China wants to strike a balance. Chinese opinion is divided about the implications of Iran acquiring nuclear weapons: some strategists believe that the balance of nuclear power in the region will suffice to prevent the use of such weapons, while others fear that a nuclear exchange in the Gulf might stop the flow of oil and bring down China's economy. China has joined the P-5 plus 1 negotiations (involving the UN Security Council permanent five members plus Germany) on Iran's nuclear status, but has not offered a policy independent of President Barack Obama's. Meanwhile the rise of Islamist extremism worries Beijing, as well it should. At least a hundred Uyghurs reportedly are fighting with Islamic State, presumably in order to acquire terrorist skills to bring back home to China. Chinese analysts have a very low opinion of the Obama administration's approach to dealing with IS, but do not have an alternative policy. This is an issue of growing importance. Instability threatens the Silk Road project at several key notes. China has no sympathy whatever for what analysts there like to call "political Islam". America's flirtation with the Muslim Brotherhood - both from the Obama administration and from mainstream Republicans such as Senator John McCain - strikes the Chinese as incompetence, or worse. But China has no capability to go after the Islamists, except for a very limited deployment of marines off the coast of Somalia. China's policy-making is careful, conservative and consensus-driven. Its overriding concern is its own economy. The pace of transformation of the Middle East has surprised it, and it is trying to decide what to do next. Its pro forma policy is to join the Iran talks, and offer to join the Quartet (the UN, the US, the European Union, and Russia) talks on the Israel-Palestine issue, but neither of these initiatives has much to do with its actual concerns. What China will do in the future cannot be predicted. 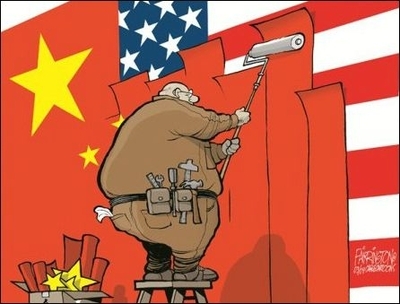 But it seems inevitable that China's basic interests will lead it to far greater involvement in the region, all the more so as the US withdraws. David P. Goldman is a Senior Fellow at the London Center for Policy Research and the Wax Family Fellow at the Middle East Forum. His book How Civilizations Die (and why Islam is Dying, Too) was published by Regnery Press in September 2011. A volume of his essays on culture, religion and economics, It's Not the End of the World - It's Just the End of You, also appeared that fall, from Van Praag Press.